When I say they are offering a few things, I mean that in the literal sense. They've got a breakfast sandwich, mini dounut and some coffee. You can get any combo of these three in a various meal combos or by themselves. Since I don't drink coffee I got one of each to try. First up was the donut. They call it mini but it's not mini in the traditional sense. It's smaller than a standard one but still a little bigger than what you'd call a mini. Today's flavor was lemon. It's a yeast style donut (think Krispy Kreme) with a sugar glaze, light lemon flavor and lemon zest strips on top. I will say it was light and airy, but it also tasted yeasty and doughy, like the balance was off. I mean you could actually taste the flour and yeast. Not really appealing. And while I liked the small notes of lemon the zest strips on top were just down right bitter and off putting. I had to take them off they were that harsh. 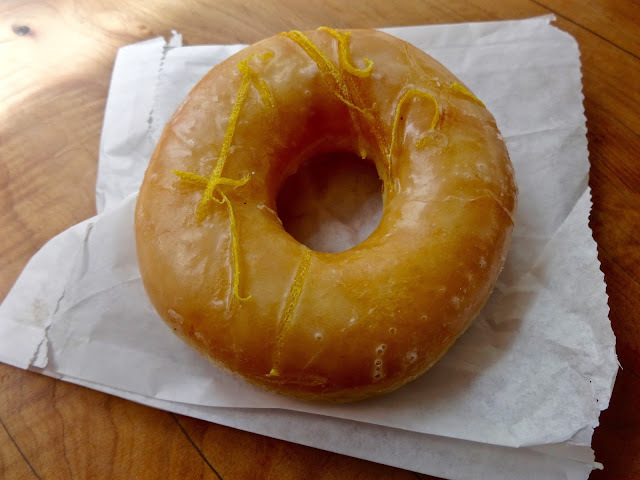 It had a nice sugar glaze though. Still, couldn't get past the yeast flavor or the lemon zing. I think the recipe needs some tweaking or maybe I just got a bad batch. Either way, blech. And to top it off, the menu said these things were .75 cents, but later when I looked at my receipt I'd been charged $1.25. No biggie in the grand money scheme of things but still a bummer considering I didn't like it. Next up was the egg sandwich with bacon and cheese for about $4. 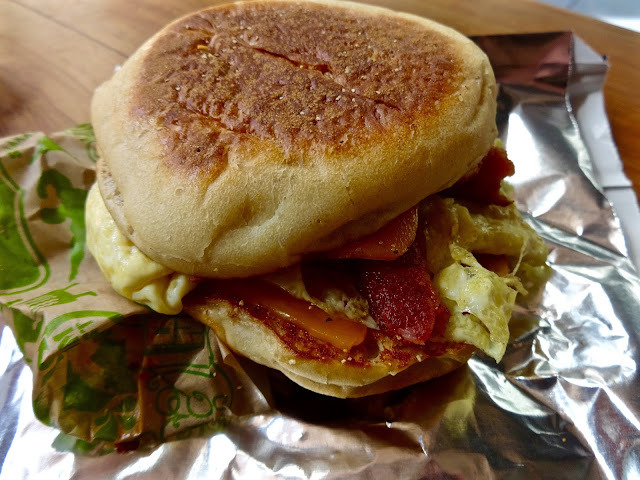 It comes served on a toasted, buttered English muffin and in the realm of city breakfast sandwiches it's a real winner. Made to order you get it hot and steamy with a generous dose of bacon and a thick slice of melty cheddar all for a less than princely sum. 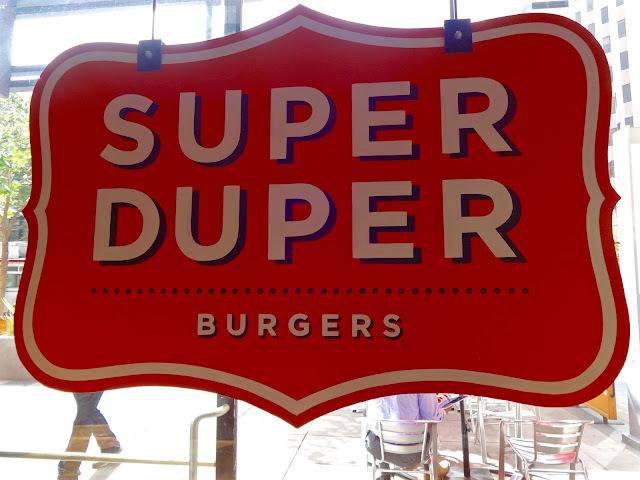 I mean it's really hard to mess up basics and bacon, egg and cheese are something that just seem to naturally go together and fortunately Super Duper isn't really trying to reinvent or California-ize what is a simple, basic and tasty morning sandwich. I'm going to rank this up there as one of the better deals in town for taste, size and price. Sometimes simple is best and this is a great grab and go breakfast. I'll probably go back and try the version that comes with sausage. So one out of two ain't bad? Yes, I'd say that's true here. While the donut was a lost cause, the breakfast sandwich more than made up for it. If you need a change from your morning routine and want to try something different, head on over to Super Duper and get the full on breakfast sandwich. They do serve Four Barrel Coffee if that's your thing you can get a combo. But skip the donut and save those carbs for a lunch or late afternoon sweet treat somewhere else instead. P.S.--breakfast is only served at the 721 Market and 98 Mission Street locations.